14 T R U C K P A R T S & S E R V I C E | O c t o b e r 2 0 1 4 T here's no shortage of product lines at Six Robblees'. With locations stretching from central Alaska to California and as far east as the Rocky Mountains, the Seattle-based distributor has a wide variety of customers. Each runs different routes, has different trucks and needs different parts. And while serving them all is a challenge, Six Robblees' perseveres. The company didn't achieve its 100 th an- niversary last year by sitting still. Originally opened as J.A. Robblee and Co. bicycle wheel repair facility in 1913, the company fi rst entered parts distribution as an automobile wheel supplier in the 1920s. It was renamed Six Rob- blees' after the brothers run- ning the operation in 1930, and eventually expanded its product lines into the heavy- duty market as a full-scale distributor. A three-time Truck Parts & Service Distributor of the Year fi nalist, the company now offers 320 product lines across its 20-plus location network. 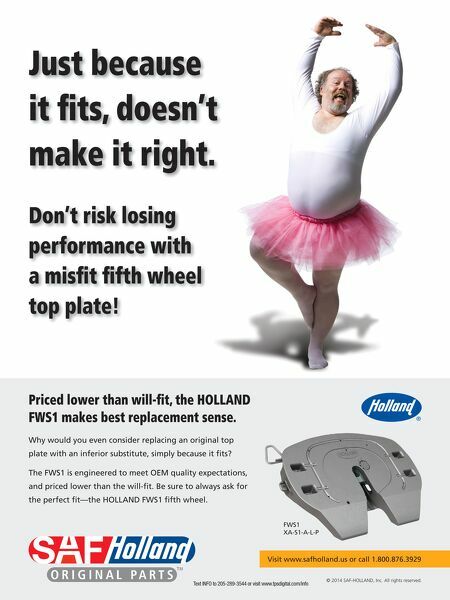 "When a customer comes to us, they can buy almost anything," says Heavy Duty Product Manager Randy Luthe. "Whenever an oppor- tunity comes along [for a new product line or service] we sit down and think about and see if it would work for us." He adds, "When custom- ers come to us, we want them to know we solved their problem." And the company makes sure its employees are pre- pared to solve tough prob- lems through comprehensive training, say Vice President of Operations Neil Hendricks and Sales Manager Kevin Kartman. 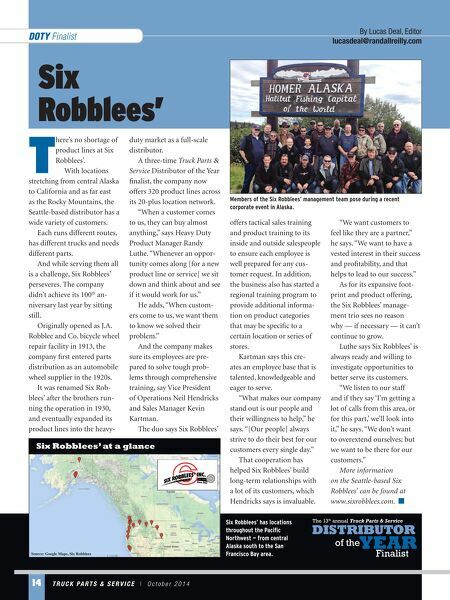 The duo says Six Robblees' offers tactical sales training and product training to its inside and outside salespeople to ensure each employee is well prepared for any cus- tomer request. In addition, the business also has started a regional training program to provide additional informa- tion on product categories that may be specifi c to a certain location or series of stores. Kartman says this cre- ates an employee base that is talented, knowledgeable and eager to serve. "What makes our company stand out is our people and their willingness to help," he says. "[Our people] always strive to do their best for our customers every single day." That cooperation has helped Six Robblees' build long-term relationships with a lot of its customers, which Hendricks says is invaluable. "We want customers to feel like they are a partner," he says. "We want to have a vested interest in their success and profi tability, and that helps to lead to our success." As for its expansive foot- print and product offering, the Six Robblees' manage- ment trio sees no reason why — if necessary — it can't continue to grow. Luthe says Six Robblees' is always ready and willing to investigate opportunities to better serve its customers. "We listen to our staff and if they say 'I'm getting a lot of calls from this area, or for this part,' we'll look into it," he says. "We don't want to overextend ourselves; but we want to be there for our customers." More information on the Seattle-based Six Robblees' can be found at www. sixrobblees.com. Source: Google Maps, Six Robblees Six Robblees' at a glance DOTY Finalist By Lucas Deal, Editor lucasdeal@randallreilly.com Six Robblees' Members of the Six Robblees' management team pose during a recent corporate event in Alaska. Six Robblees' has locations throughout the Pacifi c Northwest — from central Alaska south to the San Francisco Bay area.